Hello guys! Today I have for you something a little different and I hope it will be something you enjoy. I am going to present you with a basic design of a room, from furniture to accessories, which would be perfect for someone who has just bought a new house or just wants to redecorate a room with its basic necessities. So today’s design will focus on the home office, a room very important to anyone who works from home. My plan is to find gorgeous and fairly cheap items that come together beautifully into a simple, practical and wonderful room. I know that when buying furniture for a room, especially a new one, we try to save as much as possible but we still want to end up with a beautiful decorated space. So I will do my best in order to find not only beautiful and practical pieces of furniture that go together, but also items that are fairly cheap and that can be afforded my most people with a basic income. Today’s products come from the Wayfair website, which I encourage you to visit if you want to find other wonderful products for you home. Or, if you like my taste, just follow my website and I will post more of their products in future articles when the time comes. Your choice and I’m good with both of them. First of all, what you need at home in order to properly do your work? The answer would be a good and reliable desk. And this would not fit only in your home office but in any space of your home dedicated to your work. 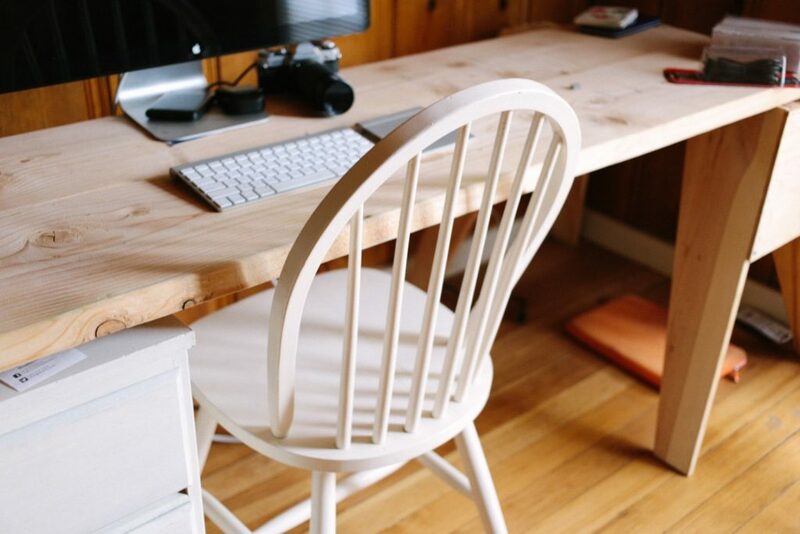 I have chosen a simplistic desk, with a clean and wonderful look and plenty of room to store the necessary items that you may need during your work time. 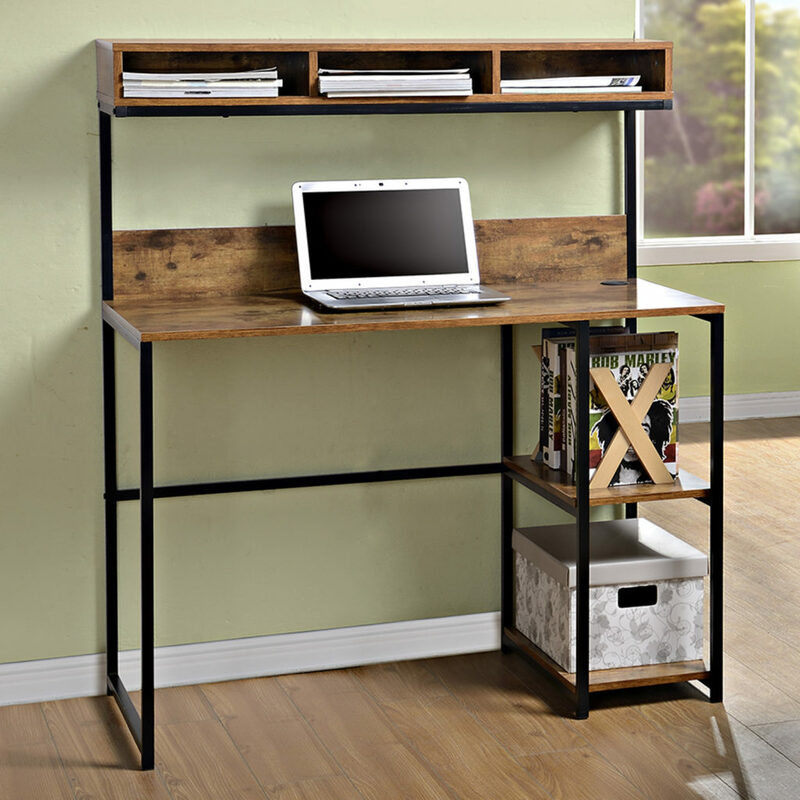 With two shelves underneath and three above, this desk is as practical as it is beautiful. The clean and natural wood look combined with the black metal bindings were a huge plus for me when choosing this desk because I feel it gives it an industrial and rough look that I like to have for my pieces of furniture. A must have for any proper work desk is a good and comfortable chair. Not too comfortable so that you relax too much and feel like you don’t have to work that hard, but also not the kind that will make you get up every half an hour because your back hurts or because you have gotten stiff from the position. A good chair has to be right in the middle and I think I may have found the right one with the good specs and a good price. 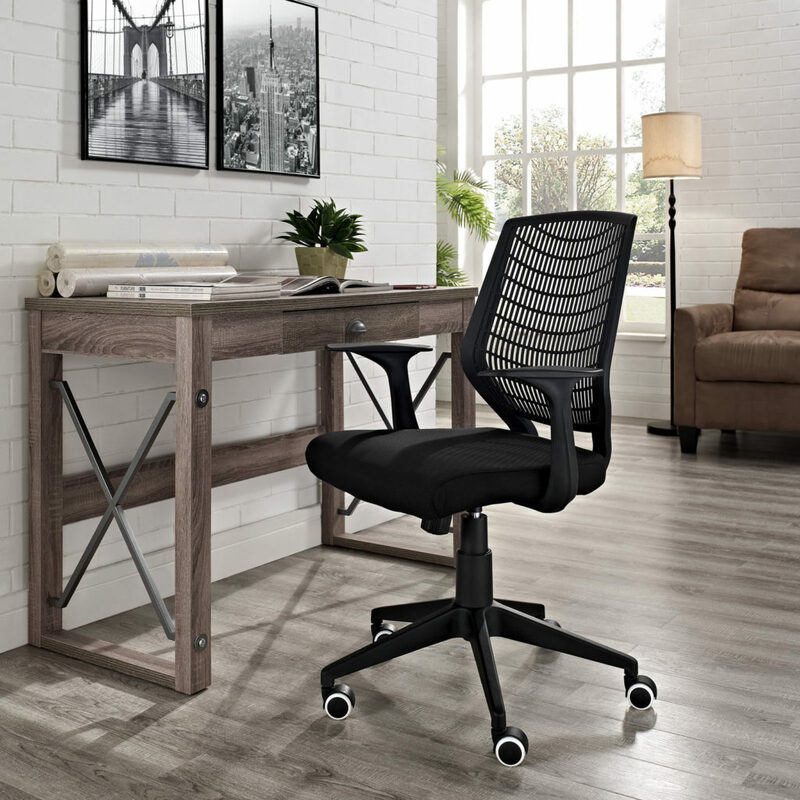 When it comes to our health we don’t have to be stingy, so this chair may cost a bit more than expected but trust me, a good chair will make all the difference to your state of mind and it will also reflect on your work. Another basic and must for any room. 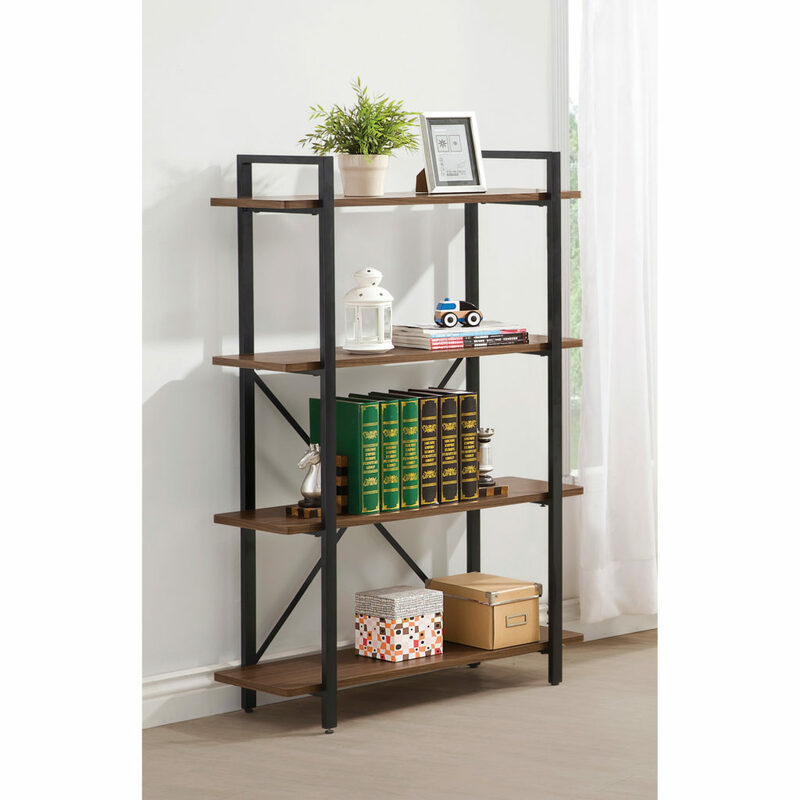 not only the home office, is a good and simple shelf. And these may be hard to find because people tend usually to go for the sturdier ones, made completely out of solid wood. But in a modern home, I’d rather go for a more simple and easy on the eye look that also lets the room and the walls breathe and lets you in control of the space. So I went for a simple unit that has only the main shelves and holding frames on the side. The rest is up to you to personalize and make it your own. And now we start with the accessories. For a well lit working space, we need a good lamp that will make us focus and concentrate no matter the time of day. 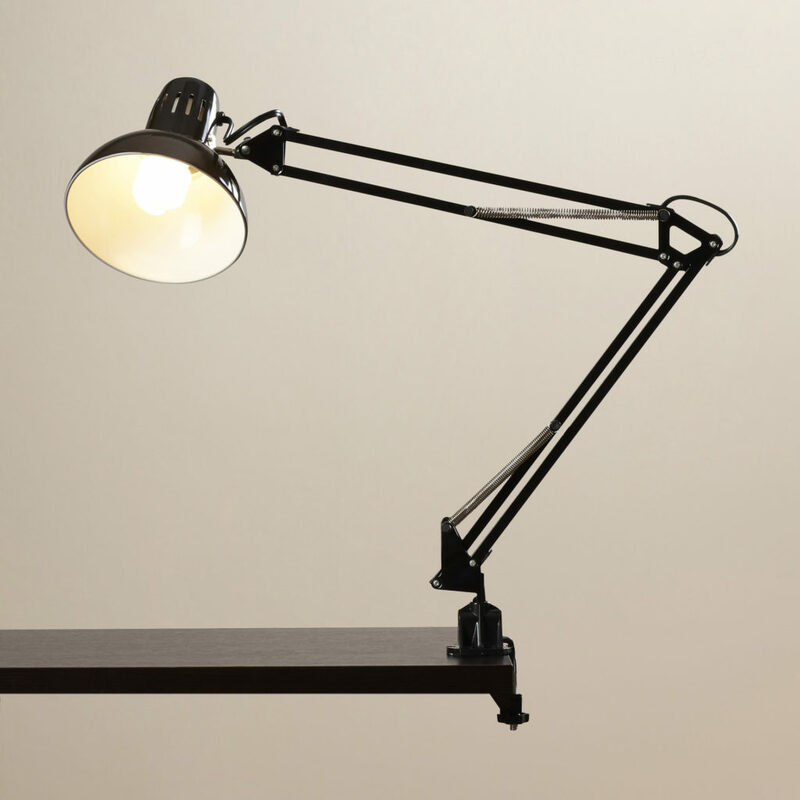 I choose a simple, black and flexible lamp and it is the very same model that I also have at home. The best feature about this lamp is that you can attach it to any surface, which goes perfectly well with the desk I have selected above. This allows you to save room on the desk surface for any other materials you may need and this will in turn make you more neat and organized. This lamp is also flexible so you can set it for your necessary height and area that you may need better lit. And here’s a tip, if you point it towards the wall, it will spread out the light over a larger surface and it can create a good environment for the entire desk area, not only the spot where the light is reflected. 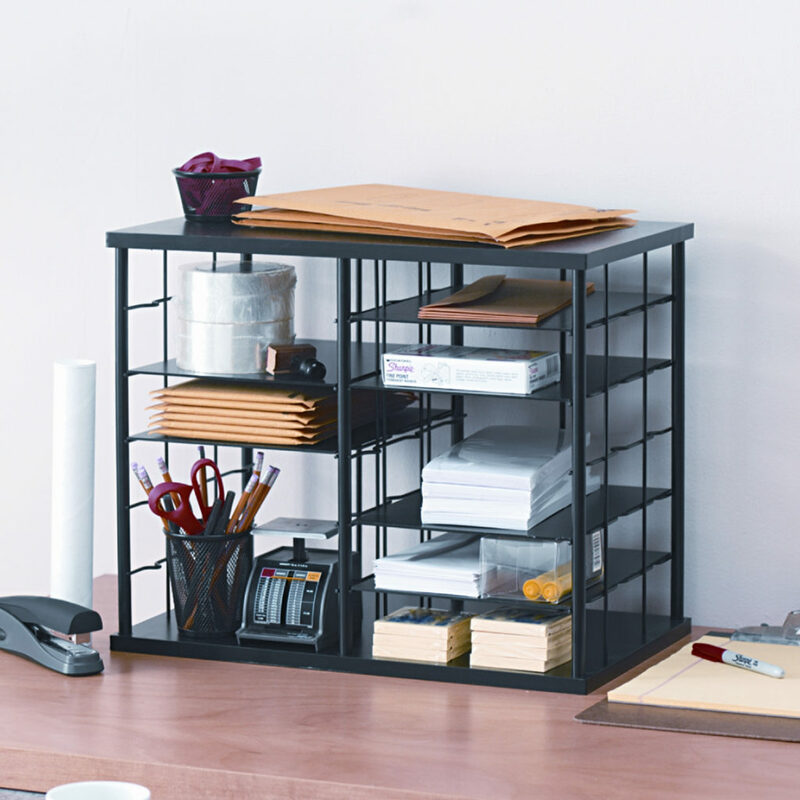 If you’re like me and you need your work space to be a little more neat and organized in order to do your job properly, then a nice and simple desk organizer can help out a lot. And I selected a little space organizer that you can keep on the desktop or one of the shelves under the desk in order to keep all your files and supplies organized and out of your way. This may seem like a large addition to your desk at first but when your desk fills up with papers and notes and all those small things for which you just can’t find a proper place, you will see and really start to value this piece. One more thing that the modern home office worker needs? 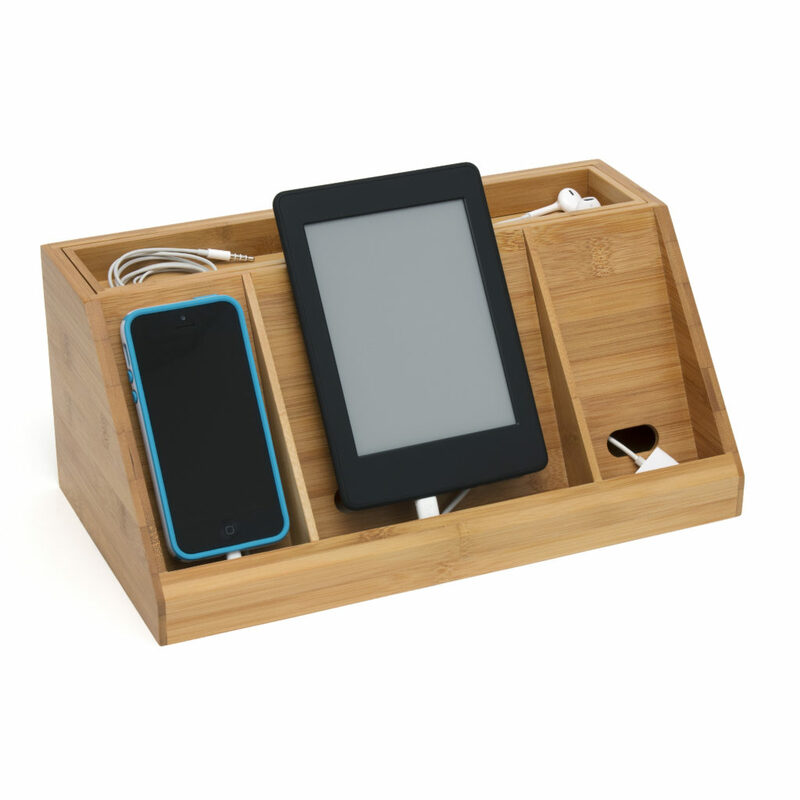 A proper charging station for all of your electronic devices. Not many of us can say that they have only one thing to charge at one time nowadays. And when we live with someone or we have people over, this gets even more annoying. So a proper charging station is always a good way to keep your desk more neat and keep your cables in a safe place where you won’t loose them and they won’t get tangled! I hope you enjoy today’s products and take advantage of today’s home office set up. With a few personal touches here and there, this room can end up looking absolutely awesome. I hope you guys like what I have to offer and if you do, I will definitely come back with another fully decorated room in my next articles. Today’s featured image comes from VisualHunt.